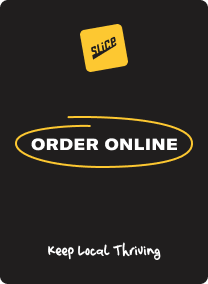 All of our food can be delivered via Grub Hub! Check out grubhub.com to see if you are in our service area! Onion, mushrooms, black olives and bell peppers. Ground beef, green chile, and Jack and cheddar cheese, topped with lettuce and tomatoes. Pulled chicken breat, diced jalapeno, red onion and cheddar cheese. Start with cheese pizza and build it your way. Pizza Toppings ($1): Pepperoni, Sausage, Ham, Pulled Pork, Chicken, Bacon Crumbles, Pulled Pork, Bell Peppers, Green Chile, Onion, Black Olives, Mushrooms, Pineapple, Tomatoes, Spinach, Pesto and Jalapenos. A half-pound lean ground beef patty, grilled to order. A half-pound hamburger topped with crispy bacon, green chile, and melted cheddar cheese. A half-pound hamburger topped with barbecue sauce infused with Jack Daniels, melted Cheddar and Jack cheeses, and a deep fried onion ring. Half pound patty wrapped in a tortilla with queso, salsa, smothered in red or green chile and topped with lettuce and tomato. Served with fries. Half pound char-grilled patty topped with bacon, green chile, mushrooms, cheddar, pepper jack, and an over medium egg. An 8 ounce patty smothered in grilled onions and Swiss cheese on toasted rye. * - Hamburgers are cooked to order. Consuming raw or undercooked meats, poultry, seafood, shellfish, or eggs may increase your rick of foodborne illness. Grilled chicken breast, with bacon, avocado topped with pepper jack cheese on a toasted sesame seed bun. A triple decker with turkey, ham, bacon, lettuce, tomato, mustard, and mayo. Bacon, lettuce, avocado and tomato on toasted wheat. Fried chicken breast smothered in our spicy buffalo sauce and melted blue cheese. Choose between three pulled pork, chicken or brisket sliders. Served on a pretzel bun with cole slaw. House made corned beef and cabbage, sauerkraut, and Swiss layered on toasted rye. Grilled beef, onions, bell peppers, mushrooms, and Swiss cheese piled high on a hoagie. House blend of sharp cheddar, gouda and swiss cheese on sourdough bread. Smoked turkey, topped with green chile, avocado and Jack cheese, on sourdough and grilled. Load your fries with cheese and bacon –or- cheese and chile for just $1 more! CHOOSE BETWEEN A SUN DRIED TOMATO AND SPINACH TORTILLA. All of our wraps come with your choice of side. Fresh Mozzarella, tomato, and basil. Served with pesto and balsamic vinaigrette on a grilled pita. Sliced chicken breast tossed in buffalo sauce, with shredded cabbage, cheddar cheese, blue cheese, and blue cheese crumbles. Smoked turkey wrapped with avocado, onions, cucumbers, parmesan cheese, lettuce tomatoes and ranch dressing. Thinly Sliced gyro meat served with onion, tomato and tzatziki sauce on a warm pita. Add an extra chicken breast to any salad for just $3.99 more! Fresh spring salad greens topped with bacon, sliced ham, turkey, hard cooked eggs, and cheddar and jack cheeses. Grilled chicken breast sliced and tossed in our spicy buffalo sauce served over a mix of salad greens. Spinach, mixed berries (or seasonal fruit),and candied pecans. Fresh spring salad greens topped with avocado, bacon, bleu cheese crumbles, tomatoes, chicken, peppers, cucumbers and hard cooked eggs. 8oz. Cube steak, hand breaded with craker crumbs and deep fried. Served with green chile gravy and smothered fries. Grilled Chicken tossed with penne pasta and Green chile Alfredo sauce. Choose between pulled pork, pulled chicken and brisket. Three tacos served with rice, beans and jalpeno avocado salsa. Grilled chicken over tortilla strips, topped with queso, jalapenos, lettuce and diced tomato. Served with spanish rice. Penne pasta tossed in pesto sauce topped with a sliced grilled chicken breast, tomato and fresh mozzarella cheese. Four strips of catfish, breaded with corn meal then deep fried and served with fries and slaw. Three Pollack fillets battered and deep fried. Served with a side of fries. We feature daily dessert specials, featuring traditional and fruit offerings ask your server for details. A made-from scratch brownie topped with a scoop of vanilla bean ice cream, chocolate sauce, whipped cream and a gaufrette cookie. Served in a martini glass. Two scoops of vanilla bean ice cream, with candied pecans, whipped cream, and a cherry. Served with your choice of toppings: Caramel and Chocolate.